Morocco! A beautiful Mediterranean country located in Northern Africa bordering the North Atlantic Ocean and the Mediterranean Sea. How fascinating it is to visit a country with an African and European flare. Morocco was ruled by the French and Spanish colonials and mainly Arabs and Berbers. Some areas are composed of refugees from Spain and Portugal. With its incredible diversity in landscape and ethnicity, you will be sure to be enriched with beautiful historical features and beautiful vistas, Morocco is a rewarding experience to its traveler. 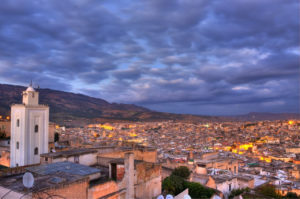 I picked out a few of the amazing cities in Morocco that you can visit. But before you go here are some few tips and pointers. If you’re traveling from a particular country, you might want to check to see if you require a visa. Sometimes referred to as the Red City, Morocco has medieval looking features but still modern in many ways. It is home to many mosques, palaces, and gardens. A barrage of marketplaces is along the lines of the streets where you can buy jewelry, textiles, pottery, etc. Marrakech is one of Africa s most popular destination sites. You can experience some beautiful and historical culture this city as to offer. 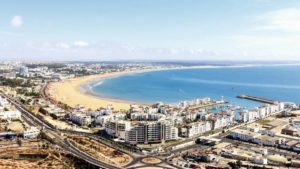 Casablanca is a modern city of Morocco that is located by the sea. The famous movie Casablanca was shot here. There ancient Medina and the contemporary mosque which is the third largest in the world is worth a special visit. Fuse with a European and Arabic style, this city is built like a Spanish-Moorish style and is surrounded by a high wall with massive doors. 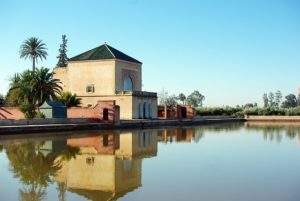 It offers around 25 mosque, hammams, palaces, inns for merchants, numerous granaries and quite a few vineyards in and around Meknes. Souss Massa National Park, hosting particular ornithologist species such as the bald ibis, white spatulas, and black-headed tchagras. The park offers endless sandy beaches, fisherman caves, cliffs and other fascinating features. Streets of Morocco, scroll through the streets of Morocco and see the people buy local products, watch the snake charmers and sample the local delectable. Majorelle Garden is a botanical garden with luscious vegetation’s, exotic plants, fountains and a museum of that highlights the Berber culture. Hassan II Mosque was built by the French Pinseau and Bouygues .C’est. It is an extraordinary religious site that is the second largest mosque in the world. 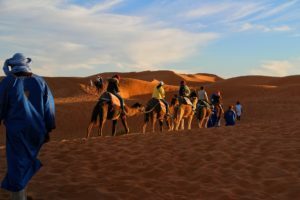 Tours discover the beauty of the Moroccan cities through fantastic tour packages which include camel trekking and bivouac, trips to the mountainous and lush valleys, waterfalls and historic sites all in a couple of days.